I am going to explain about some major measures to be taken before booking an LCL shipment with a freight forwarder. These precautions help you in handling an LCL cargo with a freight forwarder for smooth delivery of cargo and cost saving. 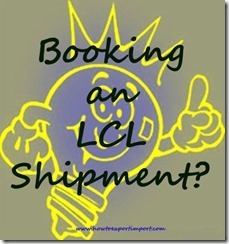 What are the measures to be followed when booking an LCL shipment with a freight forwarder? Firstly, do not expect the cargo arrival time as faster as an FCL shipment. Because, since the cargo is a Less Container Load (LCL), the goods will be stuffed in to the container, once the freight forwarder receives enough cargo to make the container ‘full’ at place of receipt. Place of receipt may be near loading port or container freight station, away from loading port depends up on location of your factory where the goods to be exported are. Secondly, there may have one or more transshipment ports before arriving cargo at final destination. Chances are there for a delay of one or more days at transshipment point also. Before appointing a freight forwarder, you need to get a clear idea about the arrival of goods at destination. Let your forwarder provide you the box closing date (container stuffing date), planning vessel schedule, vessel schedule at transshipment port if any, and expected time of arrival (ETA) at destination. Once after delivering cargo to a freight forwarder, monitor properly on the schedule of arrival as per their given planning details. If the freight forwarder does not maintain their planning details, you can switch over the forwarder to another one for further shipments. If any haulage is involved, what would be the inland haulage charges? What is the ocean freight to the port of final destination etc. Since the cargo is a Less Container Load (LCL), Freight forwarders quote the charges per cubic meter basis (CBM basis). Learn, how CBM is calculated if weight is more. Destination Service Charges – Beware of trap behind. This is a very important tip to be strictly followed by any exporter while booking LCL shipment with a freight forwarder. Get in writing from local freight forwarder about the ‘amount of charges, their counterpart at destination collects from your buyer’. This is very important because, different freight forwarders charge different amount as ‘Delivery order charges’ from the consignee abnormally in the field of LCL shipments. Because, with the understanding between the freight forwarders each other at load port and final destination, the quote at load port may be low, but higher at final destination as ‘delivery charges’. Here, once after collecting the excess amount at port of discharges from the consignee as ‘delivery order charges’ and refunds a certain amount as ‘rebate’ to the freight forwarder at load port !. So, collect all charges at load port as well as all charges at final destination from various freight forwarders and compare the charges before appointing one of them. Remember, business is relationship and your business relationship with your overseas buyer must be long term. In other words, your buyer’s loss is your loss and vice versa. However, there are very good freight forwarders working in the industry transparently. In a supply chain management system, ‘service’ plays a major role. You may have a very good relationship with your local freight forwarder. However, the same service is expected to get from all his counterparts in transit as well as at final destination. The same service is required to be delivered to your overseas buyer at destination. So before finalizing freight forwarder, you can collect the local freight forwarder’s counter part office address details at final destination. Let your buyer also satisfy with ‘no objection in shipping through the said forwarder’. If you do not know the exact volume of LCL shipment which you have shipped, you can demand a copy of survey report issued by the surveyor in CFS. This survey report can be obtained from your shipping carrier. The said volume can be cross checked with consolidator’s invoice while paying amount to them. 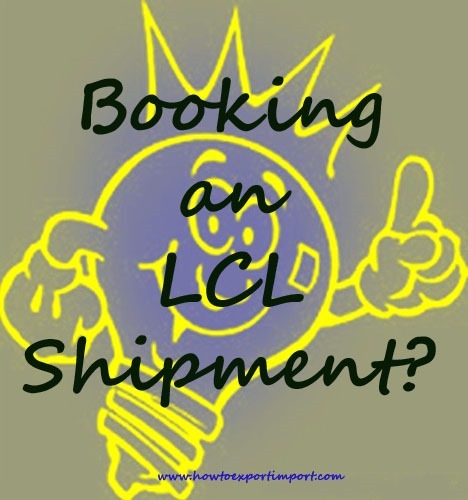 Have you satisfied with the above tips when booking LCL shipments with a freight forwarder? Do you wish to add more tips to exporters and importers when shipping as Less Container Load cargo? Share your experience in handling LCL shipments with tips to exporters and importers. John: On 05 April 2013 This article really opened my eyes on information mentioned. thanks.. thank you very much sir..
sanjay shinde: On 28 September 2013 Very useful information. TSLLogistics : On 15 February 2014 Very use full to the new firm in shipping and Logistics services/ It is also need to know that, the ship will move in time and carry the damages if there is any due to change the route. Also if there is any additional cost must inform before docking the cargo..
Sandeep Chand: On 22 October 2015 Dear Sir, I have become a victim of such malpractice and seek your help and guidance. I booked a LCL shipment from Ningbo China to Tughlakabad Delhi through a shipper in China. I made the payment to them in advance for the goods to be sent till Delhi. My shipment reached Mumbai port on 8th and was despatched for Delhi on 20th of Oct 2015. The shipping agent in CHina has used services of another agency here in India who after despatching my material from Mumbai have sent me a debit note for Rs. 105000.00 with all sorts of charges. As per me I had made the payment till delhi and am supposed to pay for what expenses are incurred in terms of Terminal Handling charges, Documentation charges, labour, transportation etc from Delhi onwards and have nothing to do as to how the material was moved in between the two points. Now my material in reaching delhi tomorrow and I am in a fix coz am paying about 1500 $ extra for no fault of mine. What can I do in this case and how do I go ahead. Please advice. prashant shah: On 30 January 2016 I order metal from Western Africa. QUATATION for order is with CIF cost. Now shipping co. Demand for insurance as its LCl order. They ask that after reaching at destination port they will refund insurance..so i cant understand its means.pl guide me. Terms used in shipping such as Air Waybill,Airbus Industries Group,Air Freight Forwarder,Alliance,All Risk Insurance etc.